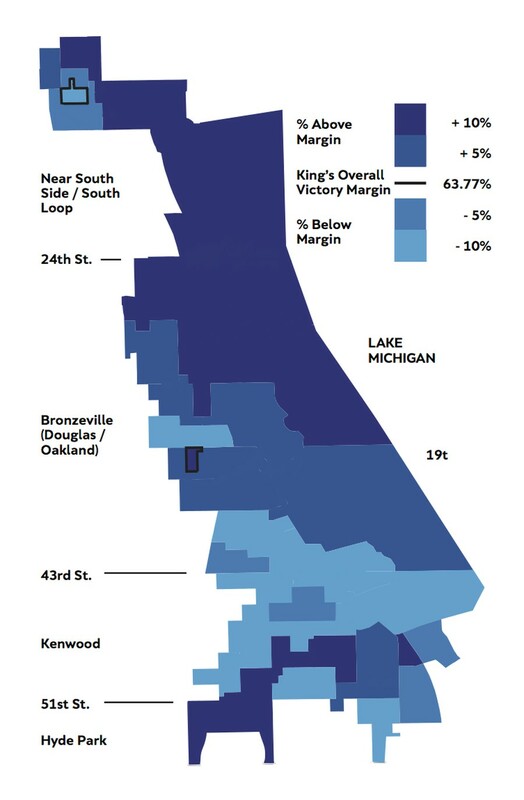 The aldermanic special election has come and gone, and the people of the Fourth Ward have chosen to retain their appointed alderman, Sophia King, by a wide margin. King swept the election with 63.77 percent of the vote. Coming in second place was attorney Ebony Lucas, with 17.54 percent. Lucas was also second in fundraising for the election. Candidates Gregory Seal Livingston finished with 6.55 percent, Marcellus H. Moore Jr. with 6.10 percent, and Gerald Scott McCarthy with 6.04 percent. King also led in campaign donations with $200,000. She and her husband are close with the Obamas, dating back to her time as a non-profit founder and her husband’s time studying for the bar with Michelle Obama. Barack Obama endorsed her last month. King was appointed by Mayor Rahm Emanuel a year ago, following the resignation of Fourth Ward Alderman Will Burns (A.B. ’95, A.M. ’98) last February. Burns took a position work at Airbnb. Initially, Fourth Ward residents were active in trying to find a formidable competitor to run against King in hopes of unseating a mayor-appointed candidate and electing one they believed would be more accountable to the public. In her time as interim alderman, King has worked to keep Fourth Ward youth safe through her “Safe Summers” initiative in partnership with the Third Ward. This program features close work with school principals and a stable sports program to keep kids off the street. She has also restored night and weekend bus service, a major concern of elderly residents, to 39th and 43rd Street.